What is the US to CAD Currency Cross? The USD/CAD currency pair represents the quoted rate for exchanging US to CAD, or, how many Canadian dollars one receives for every US dollar. For example, a USD/CAD rate of 1.25 means 1 US dollar is equivalent to 1.25 Canadian dollars – or conversely stated, that it takes 1.25 Canadian dollars to equal 1 US dollar. This forex guideForex Trading - How to Trade the Forex MarketForex trading allows users to capitalize on appreciation and depreciation of different currencies. Forex trading involves buying and selling currency pairs based on each currency's relative value to the other currency that makes up the pair. will review factors that impact both currencies and their exchange rates. The USD/CAD exchange rate is affected by economicEconomicsCFI's Economics Articles are designed as self-study guides to learn economics at your own pace. Browse hundreds of articles on economics and the most important concepts such as the business cycle, GDP formula, consumer surplus, economies of scale, economic value added, supply and demand, equilibrium, and more and political forces on both sides of the border. Below we will analyze factors that commonly impact each country. Below is a chart of the US to CAD exchange rate over the last 10 years, from 2008 to 2018. As you will notice, the FX rate has been anywhere between 0.94 and 1.46 over that time period. The two currencies have been relatively close to each other in value over the past decade. Interestingly during this time period, they have flipped back and forth between which has been the stronger currency. 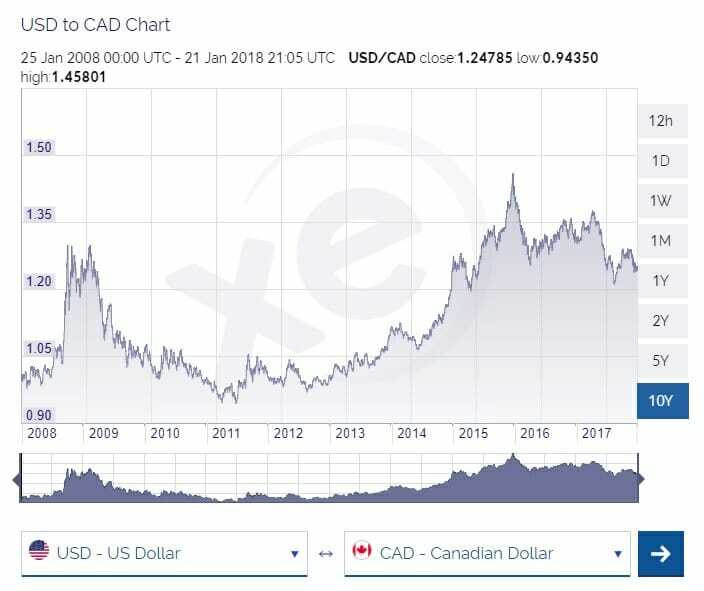 But it was only in the period of 2011-2012 that the Canadian dollar was actually worth more than the US dollar (when the USD/CAD exchange rate briefly dipped below 1.00). From late 2008 – when the full impact of the 2008 financial crisis was hitting the US – to mid 2011, the Canadian dollar was strengthening against the US dollar. Since 2011-2012, however, the USD has shown renewed strength and increased in value relative to the CAD, as shown by the strong uptrend in USD/CAD that drove the exchange rate substantially higher into mid 2015. During that same time period, the US dollar was generally in an uptrend against most of the other major currencies as well. Since Canada and the US are neighboring countries, the exchange rate has a big impact on business, tourism, and lifestyles. When the US dollar is stronger, there is some migration of manufacturing and labor outsourcing to Canada in an effort to lower costs. Additionally, there is more importation of goods from Canada into the US, and Americans will be more likely to go on vacation or buy properly in Canada, as it is comparatively cheaper. The opposite is true when the Canadian dollar is stronger. Firms will tend to import more from the US into Canada and Canadians will be more likely to vacation and buy real estate In America. 5-Step Guide to Winning Forex Trading5-Step Guide to Winning Forex TradingHere are the secrets to winning forex trading that will enable you to master the complexities of the forex market. The forex market is the largest market in the world in terms of the dollar value of average daily trading, dwarfing the stock and bond markets. Forex Trading; How to Trade the Forex MarketForex Trading - How to Trade the Forex MarketForex trading allows users to capitalize on appreciation and depreciation of different currencies. Forex trading involves buying and selling currency pairs based on each currency's relative value to the other currency that makes up the pair.